Recently I connected with church leaders from 33 churches from across North America and asked them to share with me what they are doing for gifts for their first time guests. This continues in a series where I’ve asked other church leaders to help us learn what is happening at their church … earlier I’ve done posts on church bulletins, adding new services and the “other holy days“. I’m thankful for the leaders who took time out to help us all learn! Show’s Guests That You Expected Them! // Think about the last time you were invited over to a friend’s house … did they get their place ready for you to arrive? Good friends do! We set out a few snacks, have the drinks cooled, light some candles … all signs to our guests that we expected them. 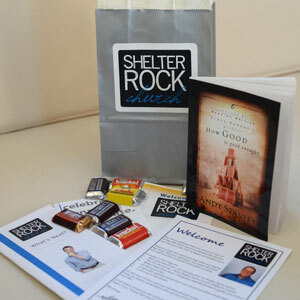 You are inviting guests to come to your church and a great way to indicate to them that you expected them is to have a gift ready just for them. As a thank you for taking the risk to come and visit you! First Impressions Count // When people are new at your church they notice everything … the grass growing up in the parking lot, the unclear signage, that funky smell in your kids space … a well thought out gift creatives a great initial experience for your guests. It creates a “moment” that has potential to say a lot about your church. Think through what first impression you want to give to your guests and build your gift around that. Extend the Experience Beyond the Weekend // Why do you people buy t-shirts at a concert when they could probably get the same t-shirt for much less online? Why does every major ride at your favorite theme park exit out through the gift shop? People are looking for souvenirs from experiences that matter to them. It’s a way for them to take a piece of the experience with them back into their “normal life”. When you give people a gift to take home it has the potential to help them recall the positive time they had at your church and implicitly invites them to return. Clearer Explanation of Who You Are // Although when people come to your weekend service they will get a good idea of what it’s important to you … chances are every weekend doesn’t represent the entire picture. A gift for your guests gives you the opportunity to explain what makes your church tick … you can give them an inside look at what it means to be a part of you community. It’s a perfect opportunity to define the “next step” for them as they are just entering community. Invite them to come back! // One the realities of growing churches that they are just better at getting their guests to come back. In fact, the difference between a stagnant church and a growing church is often that stagnant churches only have 1 in 10 guests return while exploding churches are getting 3 in 10 guests to come back. The gift for your guests is a part of asking your guests to come back. In fact, some of the churches studied actually have two tiers of gifts … one for “first time guests” and then a second for “returning guests”. Make sure your gift asks people to come back for whatever it coming up next at your church! Slows Down the Weekend Experience // If you give the gift to your new guests as a part of the weekend service experience then it slows that experience down and ensures they need to interact with someone. They shouldn’t just pick up the gift up off a table somewhere … but they should to interact with some amazing members of your volunteer team who are particularly skilled in working with new guests. This “speed bump” ensures that new people are interacting with even just a few people at your church before they escape out the door and into the parking lot. During the Sunday Experience // Some churches use first time guest gifts as a thank you during the actual Sunday they attend. These churches generally have guest go to a welcome desk or dedicated first time guest area. The advantage of this approach is that the guest leaves with the gift in tow after their experience and they’ve met some members of the church’s team. 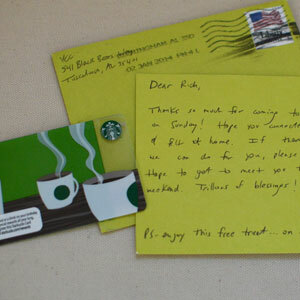 As a Follow Up After the Experience // Other churches send the gift in the week following the guest’s visit. Sometimes these are mailed or in some cases hand delivered by a follow up team. The first church I served at did this … we had a team of people that delivered home baked cookies the week after the visit! This approach implicitly asks people to come and visit your church the following weekend. A Promised Gift for a Second Visit // Another time that churches will give gifts to guests will be as an incentive to return that second time. Sometimes these gifts are given in combination with the “first time gift” and sometimes they are just offered to the second time guest. By rewarding these guests for coming to your church another time you are rewarding the behavior you want … people to return! From my perspective, the best time to give a gift to a someone new at your church is as a part of their experience. We give our gifts for everyone who is new and hands in a “new here” card. We have a specially trained group of volunteers that help these guests feel extra welcome to the church. We go out of our way to ensure they know what they need to know about our church … and take some first steps to seeing get connected. We want that first experience with us to be a super positive one … first impressions matter! Rather than just talking about what churches give to their guests I asked some friends to send me what they give away. 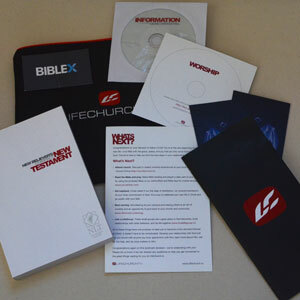 Here are samples from 8 churches … be inspired! You can download high res versions of these images in the unSeminary Members Only section … if you aren’t a member you can join now for free. Free coffee at their coffee bar. Water bottle full of candy! 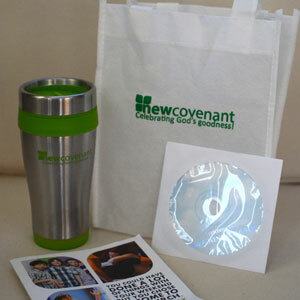 Welcome pack with all kinds of information about the church. A Welcome CD about the Church. Clear directions on how to get plugged into the church. Flyers on various ministries of the church. A church branded travel coffee mug. Welcome CD about the church. Andy Stanley’s “How Good is Good Enough?” Book. Flyers about the ministries of the church. $5 gift card for their store. 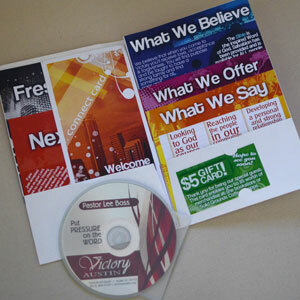 Various brochures about their ministry. Start with What Your Guests Would Like! // Remember when you were a kid and your dear Aunt Lucy gave you that out of date sweater that was two sizes too small … you started calling her Aunt Lousy. Don’t do that to your guests! Make your gift something that other people will really want to get! Be creative. Create a WOW! moment for them. This Will Cost Money. // The average spent across all these churches for their gifts was $4.88 … the lowest was $0.75 and the highest was $15.00. First impressions are important as a church and this is strategic resources for you to invest. Figure out what you would be comfortable spending on these items … then budget 20% more. Your guests deserve it … they risked a lot to come to your church and you should reward them. Give Guests a “Next Step” // Across the board the churches that seem to leveraging first time guest gifts the best are giving them a clear next step to take. They have a new comers class … or a reception with their pastor … or even just a group of people dedicated to helping first time guests get connected to the church. It isn’t random … their is a clear communication on what guests are suppose to “do” next. What are you learning about first time guest gifts? I’d love you to join the conversation leave a comment! Rich, I remember you mentioning awhile back that your church made a switch in what you gave as a gift that drastically increased the amount of guests who turned in cards. Can you talk a little about that? We used to give away a chocolate bar and some flyers about our church. In the last year we did that we gave just over 800 of those bags. Then we switched to giving away t-shirt … a well designed t-shirt … and the first year of doing that we gave away 3,500 “new here” packs! Apparently t-shirts are better than chocolate bars! For us that was all win … that means we have almost 5 times as many “new here” cards for us to follow up on. It’s been a part of our growth strategy as we loop back with all those guests. Make sense? My lesson from that was … give people a gift they want … and you’ll be able to get their contact information. Rich, I was curious if you could email a pic of your “well designed” t-shirts just to get an idea of what types of info you out on them. Thanks for the investment you make in other churches! Sure … here is a link to the slide we show on Sunday mornings at this point in the service … it shows the shirt and the card we ask people to fill out: http://db.tt/xI0SZV0z You can see the t-shirt if pre-splattered … people are going to use this as a painting t-shirt anyways … right? Hope things are great with you guys! That is one cool shirt! I want to be a first timer! Picture of the t-shirt appears to have disappeared :-(. It seems as though the link has expired. Do you have another picture of the “well designed” tshirt? Thanks! Great stuff Rich thanks. One question. When you include a T shirt in your gift bag how do you know what size to put in or do you give the T shirts out separately? Great stuff Rich, thanks. I assume you hand the T shirts out separately rather than part of a gift bag, otherwise how do you know what size of shirt to give? Great question … we actually have our guests go to a “New Here” kiosk with some volunteers at it. The beauty thing about t-shirts … is it creates an opportunity for our volunteers to ask our guests what size they are. That intentionally slows the interaction down … gives us a chance to interact with the guests. The volunteers check the guest’s contact information on their card, ask what size t-shirt they are and then pick it out of a bin and put it in the bag. Late in the discussion question here, do you just give one shirt per family or one per person visiting? Good question… One per adult … Our kids team has gifts for first time kids as well. Of course, if they ask for one for their kids we’ll give them those as well. I’m wondering…with the 800 > 3500 “new here” response increase, did you see a retention increase? Or maybe better, what was the overall growth in your church those 2 years? Just overall attendance. That’s what I’m trying to marry in reading many of these type of things. How does those 2 connect? Thanks for all your help! Really enjoying the site. We have indeed seen an increase in our growth rate since this switch. Now it’s not just the t-shirt driving that, we made a number of other changes that are helping that. On top of that … we see the collection of all this first time guest data as a part of our campus expansion strategy. Having the names and addresses of people who have visited helps us in future location selection and gives us people to follow up with and invite to be a part of those new locations. Thanks again! Have a great week. Great stuff as always! I always appreciate your insight and friendship. I was curious about how people get these gifts. More specifically, are people asking guests to come to a VIP area for guests to meet pastors/staff etc, tent, or just an information area? What have you seen and what do you guys do a liquid? We have a table called Ridge Central for our guests and lots of free resources for everyone outside our worship area. For us we have a dedicated “new here” area at all of our campuses. There is a team specifically trained for this station. Their job is to slow the guest down a little bit and make sure they get their t-shirt! We switch from having this as just one piece of the “information desk” to making its own kiosk. This allowed us to focus our team on this task … as well to make it super obvious where people who are “new here” are suppose to go after the service. In our context they get their free t-shirt in exchange for their “new here” card … which is in every bulletin. Do you all call your first times guests when following up? We do make phone calls to our first time guests … introducing them to the people who can help them get connected. 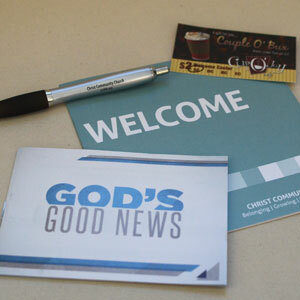 At Christ Community Church we have a Welcome Center which we direct first time guests to. Our aim is a good relational connection, so that we can show how much our guest’s matter to God by showing them how much they matter to us. We hand out our Welcome Packets after having had a good relational connection, having offered a church tour, and having offered to pray for people. We do not request guests details having handed out a Welcome Packet unless they offer them to us. Our aim is to give our guests a warm relational experience so that they will want to come back a second time. We have deliberately included a gospel tract in the Welcome Packet as that is our central belief at Christ Community Church. Funds from our coffee bar go directly to Missions Trips, and so by including a free coffee voucher, we get the opportunity to talk about our desire to share the gospel with other nations. For other forms of guest follow up and connection we have a tear-off section in our weekly program which people can put in the offering bags to request prayer help or further information. At Christ Community we are seeking to update our ‘branded gift’ and I also like the idea of giving out a book which our pastor has written. 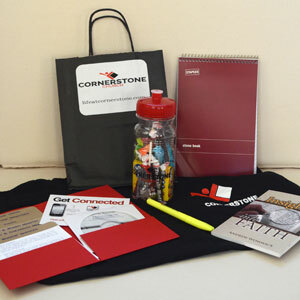 Here are some helpful web-pages for branded gifts which can be purchased in bulk. On one of your posts you talk about a church that sends its first time visitor gifts by UPS/Fedx and they arrive on Monday afternoon. Can you talk about how they do that to get it there on Monday? Thanks so much … I’m not sure which one your talking about. Do you have a few more details so I can chase it down for you? Great site! Question. We’re a pew-less church who doesn’t hand out bulletins at the door. Any ideas on the best, most effective, way to share guest cards? We merged with a smaller church so it’s hard to know who is a “guest” and who is not, making handing them out at the auditorium door a bit difficult. We’ve tried putting them on the seats in the auditorium but most end up on the floor or destroyed. I’d keep putting them on the seats. You’ll loose more than you’ll receive but the “new here” guest contact information is worth it. Thanks for the feedback, Rich. I look forward to visiting your site more often. So do you give ONE t-shirt to the family/couple or one per person? How does that work? We give them one for every person in their family. Generosity wins! Thank you! I appreciate your insight and work collecting this very useful information. Blessings and Harvest to you and your church! Thank you for the valuable information. We are in the process of launching a new Church so funds are tight. What would you recommend as a budget friendly welcome gift? Also, we would like to eventually hand out shirts as well. Up to what size do you carry? That’s a tough one … I would attempt to reroute budget to this area. What’s more important than connecting with new here guests? Thank you for all the great ideas! I’m researching the T-shirts! I think something like that solves the challenge of not getting guests full information. We too, have a guest kiosk, but I love the idea of a dedicated area with volunteers staffing! 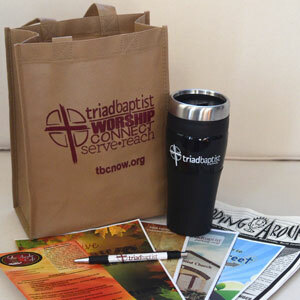 I wanted to know if any of you know of a service that makes great welcom gifts bags for churches? Can you repost the link to the t-shirt? It is no longer available. The link with your tshirt design is no longer available. I would be very interested in seeing your shirt design. Does it have your church logo. We are thinking about doing a first time guest tshirt giveaway. Are you still doing this? Is it still effective? Any information would be greatly appreciated. Great article, Rich. Could you expand on the gifts you give to visiting children? Are gifts given to preschool, primary school age and youth? Thanks! Alan Danielson on how your church’s DNA impacts your Small Group Ministry.